A book was being written long back, it created such a stir that a decision to ban the book was already taken by the British Government. The first edition of 2,000 copies appeared on 18 March 1929, and the book was banned on 22 March 1929. Between this gap of four days, 1,700 copies were sold. Mahatma Gandhi described this proscription as “Daylight Robbery” and advised the people to break the law and to face imprisonment rather than submit the book to the authorities. 'How India lost her Freedom' the book that the British banned is out now and focuses on the crucial facts and events that led to the establishment of British rule over India. The early British historians tried to play down the role of their countrymen in subjugating the native kingdoms in India by all means. It was left to a few diligent historians to carry out painstaking research and unravel the facts. Pandit Sunderlal, who wrote this sensational book originally in Hindi in 1929, vigorously exposed the British plan to enlarge their sphere of influence in India slowly and steadily through a number of dubious methods. Apart from revealing the state of affairs between the Indian native kingdoms and the East India Company, How India Lost Her Freedom provides a fine account of what India was prior to the advent of the British. Pandit ji has quoted extensively from the original sources, exposing in particular the translations of Elliot and Dowson among others. It is a great tragedy of our times that most Indians are unaware of the true facts. Many serious controversies currently prevalent in our society can be understood in the correct light when you read this book. People will then discover shocking untruths and totally false so-called facts, which are accepted today by society, to be the creation of fertile minds intent on dividing the Indian society and weakening it. RH Khwaja, former secretary to the Government of India, in the foreword of the book says, "It is my sincere and fervent hope that all readers of this book will start understanding that it is only through peace, empathy, tolerance and compassion that a nation and its people can develop. The seeds of bigotry and violence cannot blossom into fragrant flowers of peaceful coexistence." 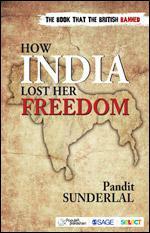 Read this freedom fighter's account of India's struggle for Independence. A book that explicates how the British came to India, slowly penetrated the sub-continent and established an empire...a story recorded by many historians but not fully told. Grab your copy of this book today at an exclusive 20% discount. Write to us at marketing@sagepub.in with code SM20.